Watch bollywood movies from the three major languages in India - Hindi, Telugu and Tamil. Stream music, read lyrics and create custom ringtones from your favorite music. *Pin favorite videos as live tiles for one click access. *Search movies by keyword, cast and filter by genre. *Stream music from your favorite movies in the background. *Read lyrics of your favorite songs while you listen. *Play memory game based on movie cast. *Download new movies Information automatically from cloud. *Rate movies and songs for other people to see. *Get notified on the live tile when new movies are added. 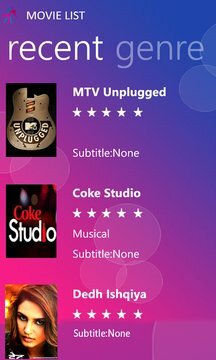 *Pin movies as live tiles for one click access. *Keep track of your favorite movies and songs across app updates. *Look at top rated music videos on start screen based on user ratings. *Video player now has HD support. **In Threaters section with movie reviews and trailers. **Pin favorite people to the start screen and get notified when new movies are added for that celebrity.